Sentry scalps post news spike movements for high probability trades. It works like this, if the market moves one direction quickly and then retraces (pulls back) a certain amount within a certain amount of time, Sentry places a pending BUYSTOP order above the high and a pending SELLSTOP order below the low. If one is filled the other gets cancelled using OCO orders (Order Cancels Order). Statistically if the high -or- the low of the initial volatility bar is broken, the trade will run for at least a few pips, more than 65% of the time (depending on settings). The best part about trading spikes this way is we are avoiding the highest volatility moments, the initial push, when all the slippage, spread widening, re-quotes, bad fills, and broker manipulation happens. By avoiding the initial push with all the HFT algos and lack of liquidity (which causes slippage), we are taking much safer entries. Two stage spread filtering ensures entries are only taken during times with the highest statistical probability for success. Developed on the 1 Minute Time Frame EURUSD data. Money Management - choose "Dynamic Lots" and "Static Lots" drop-down menu. 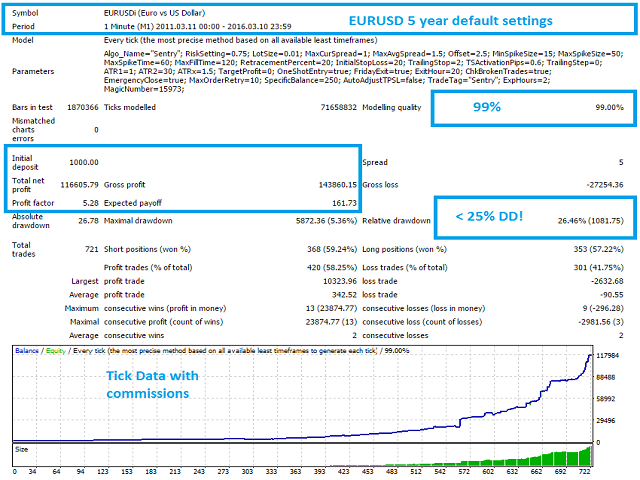 Risk Setting - risk setting to be used with dynamic lot sizing. Fixed Lot Size - if using fixed lots, this will be the lot size. Max Spread Live - maximum spread allowed at time of trade. Max Spread Avg - maximum average spread (last 30 ticks) allowed for operation. Offset Above/Below bar - (pips) This is the amount of pips above and below the bar the stop orders will be placed. Min Spike Size - (pips) The Minimum spike size to be considered. Max Spike Size - (pips) The maximum spike size to be considered. Spike/Retrace Time - (seconds) The max time allowed for the spike and retracement to happen. Max Fill Time - (seconds) The max time allowed for the pending orders to be filled. Retracement Percentage - Example = 20. If 20 is entered the spike must retrace 20% of the entire movement to be considered for trade. Initial Stop - (pips) This is the number of pips to be used as the initial stop loss before the trailing stop is activated. Trailing Stop - (pips) Number of pips to be used for the trailing stop. TS Activation - (pips) Number of pips the market must move into profit before the trailing stop is activated. 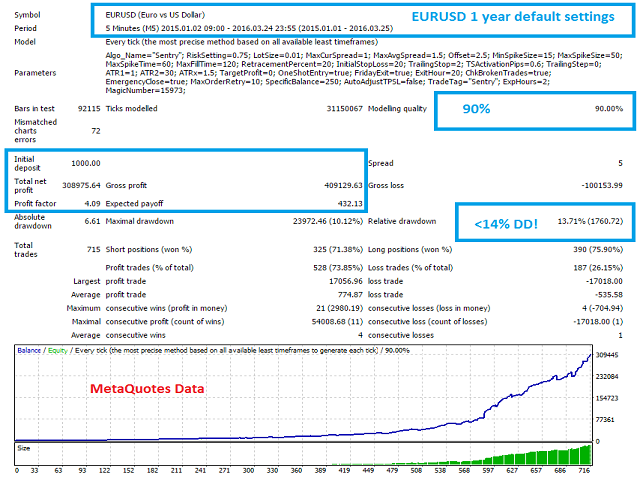 Trailing Step - (pips) Number of pips you'd like the trailing stop to "jump" by. 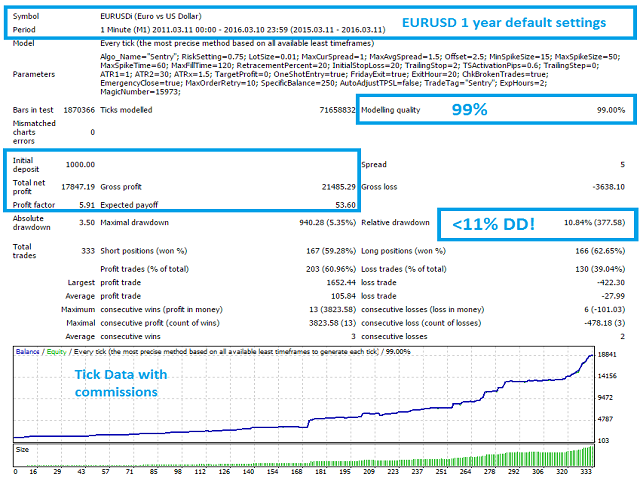 For example 0.5 entered would have the trailing stop (Any size trailing stop) only move in 0.5 pip increments. ATR2 - Period for ATR2. Same as above. ATRx - ATR Multiplier . This multiplier is used in the algorithm mentioned above. Target Profit - static target profit. Not recommended. Trailing stop is always recommended. Enable One Shot Entry - If true. Entry will only be attempted once per bar. Enable Broken Trade Check - When set true, this will check for broken trades as soon as they have been opened. A broken trade is a trade with no protective stop loss. Emergency Close - If set to true and "enable broken trade check" was not able to place the proper stop loss (because of fast moving market) a MARKET CLOSE order will be sent to close the position immediately. Max Order Retry - The max number of tries to resend an order. Time Filtering - choose "No Filter", "Skip Quarters" (skips trading if minute is 00,15,30,45 to avoid news spikes), and "Quarters Only" (only trades if minute is 00,15,30,45 to capture most news spikes). Initial Balance - choose "Account Balance" or "Specified Balance" (set a specified balance for EA to use) in the drop-down menu. Specified Balance - Specified amount. Broker Digits - choose 4 or 5-digit . Auto Adjust TP/SL - If true, EA will automatically adjust your Stop loss and Target profit levels > brokers min stop levels. Show Alerts - show or hide alerts. Display Background - choose between Solid and Transparent. Pending Expiration Hours - Number of hours to hold pending orders as valid. Magic Number - serial number for the EA. I find the EA very well. The EA traded not really often but if then very good. Extremely important is also likely the response time of the broker and the VPS (i have 1.5ms).